While many of us would like to pack-in the day job and emigrate to the other side of the world to live on a tropical island, few of us have the gumption – or the means – to do so. One individual who can however, is Jeannette Spits, entrepreneur, yachtswoman and travelista, who decided to travel and cross a large part of the ocean on a sailing yacht, to put down roots. It’s almost impossible to picture Jeannette Spits back in England, running her own IT company but that’s what she was doing until 2014, although her first love was always sailing. Spits’ love for the sport dates back to when she was in her early 20s, when she first got the opportunity to learn to sail in her native Holland, before settling in England for the next 30 years. A mother of three children, she and her former husband were keen and proficient sailors and hence sailed to the waters of the South Pacific, which had ignited a passion in her. Once her children were fully grown, Jeannette decided to pursue her lifelong dream of emigrating to the South Pacific. With no native French, like Moana on a mission, Spits crossed an ocean and navigated unpredictable choppy waters, eventually reaching French Polynesia. When she arrived in the South Pacific, she set about looking for the ideal spot upon which she could build her dream home. While she first sailed around some of the more obvious options, such as Bora Bora, Fiji and Tahiti, she found her utopia on the island of Taha’a, un unspoiled vanilla-scented botanical beauty spot, complete with tropical gardens, a turquoise lagoon and coral gardens. Once Jeannette discovered (in 2012) that French Polynesia were welcoming European investors and allowing them subsequently to become residents, without being able to speak French or the mother tongue, she set her sights on buying a plot of land. In 2014, she began negotiations with a French couple, to buy their much-loved home, upon which, Jeanette would construct the house of her dreams. 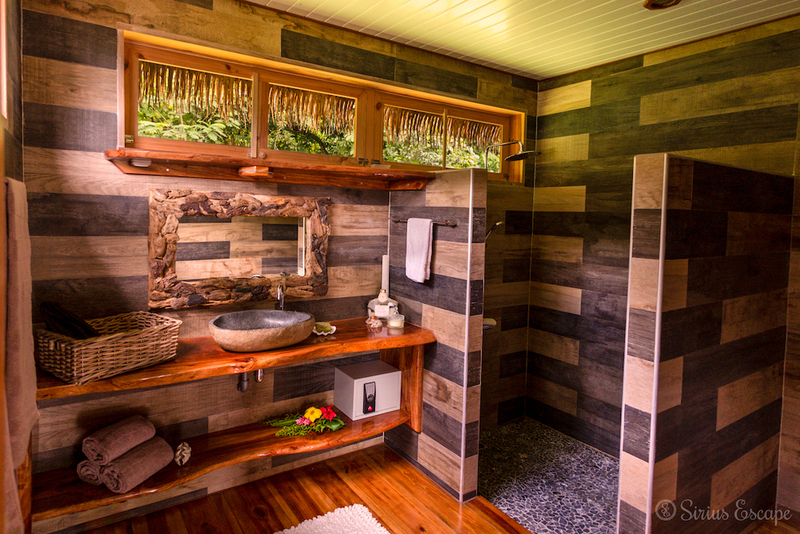 While living aboard her sailing yacht, come rain or shine for over two years, Jeannette resolved to entwine elements of their aesthetic with her own vision of a Polynesian abode. She found an architect and two talented building constructors, who were able to rebuild from the ground-up, according to her specifications, while remaining sensitive to both the environment and the previous dwelling. Aito, Fakata and local pine was used to rebuild the retreat with soaring beam ceilings. For the majority of the structure, wood materials were sourced from Taha’a or neighbouring islands, also incorporating felled trees from the surrounding land. A commitment to sustainability runs throughout and the house itself has been fitted with solar panels and a state-of-art water purifying system. 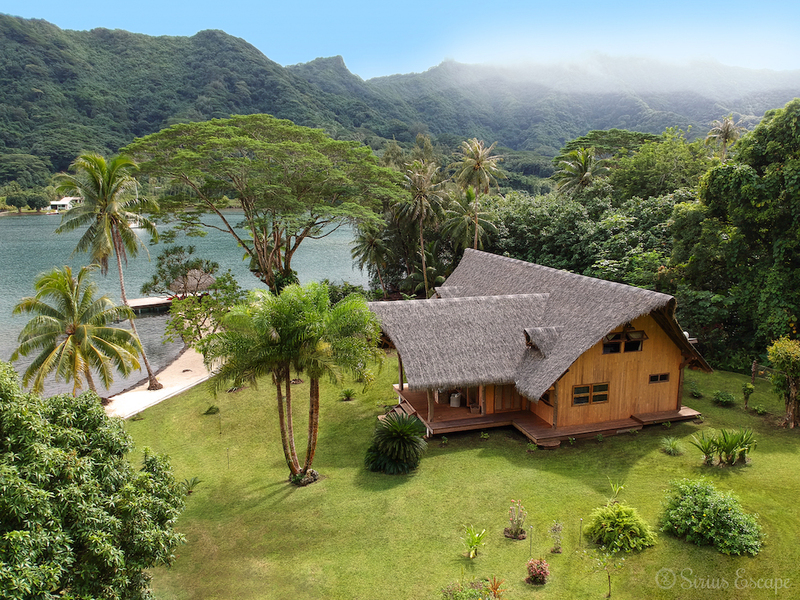 The overall aesthetic is governed by authenticity, according to the principals of a typical Polynesian build. Complete with hammocks, thatched roofs and terraces facing west, Sirius Escape is nestled within tropical gardens, framed by palm and coconut trees. Spits also designed the hardwood bed frames, coffee tables, worktops and clothes rails, made and reworked from hand-hewn trees gathered on the island, as well the Swiss Family Robinson-luxe staircase, constructed from rope and wood. Inside both the main house and the over-water living space, you will find plenty of textures, comfortable cushions and rattan mixed with mahogany. After crossing an ocean to design and build her dream home, she has now launched it as a private rental and is already curating the kind of once-in-a-lifetime experiences that money can’t buy. She will also be happy to invite guests on her private yacht, so to share and explore the neighbouring islands. It’s not simply that she has built her own dream home in what she considers to be paradise, or that she plans to use her inside knowledge of the islands to curate luxurious adventures for her guests. The real sign of her success for her is that she is now considered a local.